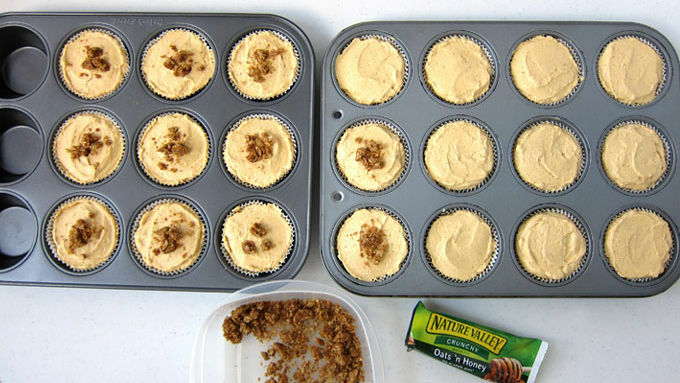 To make the GRANOLA CRUST, line 18 muffin tin cavities with paper liners. In the bowl of a food processor, combine 4 of the 2-bar packs (8 bars total) of the Oats ‘n Honey Granola Bars with the 4 Cinnamon Brown Sugar Nature Valley™ Soft-Baked Oatmeal Squares. Pulse to small crumbs, then pour into a mixing bowl. Using a fork, stir in melted butter and honey until well blended. Equally divide the crumbs among the 18 muffin cups. 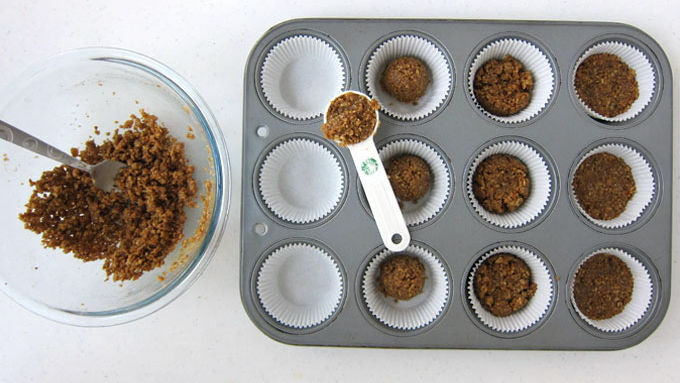 Press into an even layer in the bottom of the muffin cups. To make the PUMPKIN CHEESECAKE FILLING, beat cream cheese until light and fluffy. Beat in the sugar until well combined. Add the pumpkin puree, pudding, pumpkin pie spice, cinnamon and vanilla, and mix to combine. Add the whipped topping and beat just until incorporated. Equally divide the cheesecake filling among the 18 muffin cups. Break the remaining 2 granola bars into very small pieces and sprinkle them over the tops of the cheesecakes. Freeze for at least 1 hour. 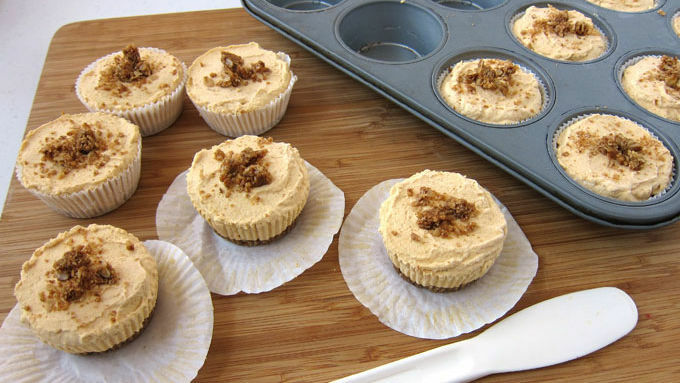 Use a thin plastic spatula or knife to lift the cheesecakes out of the muffin tins and peel off the papers. Allow the cheesecakes to thaw for 15-25 minutes before serving. Store, tightly sealed, in the refrigerator for up to 5 days or in the freezer for up to a month. Prep these little no-bake treats in about 20 minutes. Then just sit back, relax and wait for the magic to happen. Want a quick and easy dessert to make that is bursting with the flavors of fall? 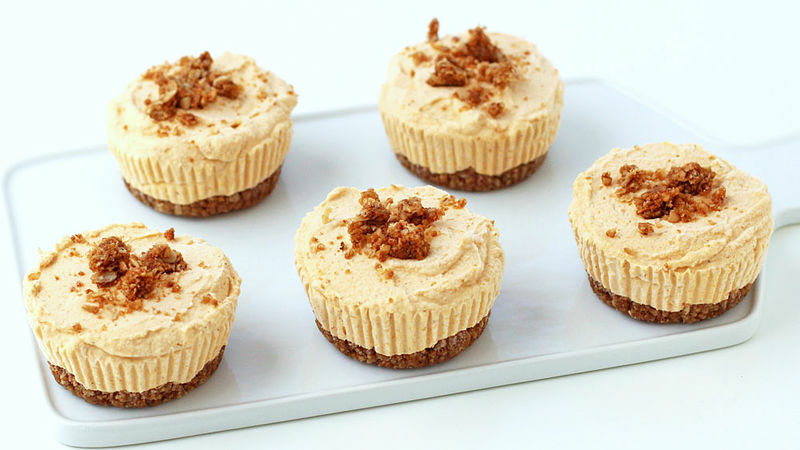 Give these no-bake pumpkin cheesecakes a try. You can eat these while they are semi-frozen, but they are even better once thawed a bit. So let them hang out on the counter for 15-25 minutes before serving. If you don’t have a big crowd to feed, seal any remaining cheesecakes in an airtight container and pop them in the refrigerator or freezer to keep for another occasion.